What is the Migration Nation? Migration Nation is a highly topical book about multicultural marketing today. 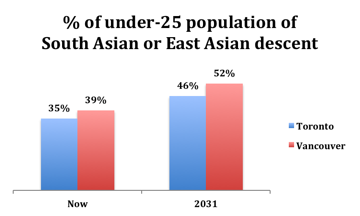 Canada, which has an aging demographic, low birth rates and labour shortages, welcomes around 300,000 new immigrants each year and this intake is only projected to rise as capital moves rapidly across continents with Canada’s new migrants bringing in new commerce and transcontinental networks that are fast shaping the cultural and business landscape in this country. Diversity and diaspora are thus key facets of the Migration Nation. New Canadians are the pulse of Migration Nation, where every one in five Canadians is foreign-born. Darrell Bricker, CEO of Ipsos Global Public Affairs and author of The Big Shift often talks about how power is shifting in favour of talented, highly skilled migrants in a borderless world, where authors Kathy Cheng and Robin Brown reminisce over the joke that “free Wifi” is the new low in Maslow’s hierarchy of needs . The authors of Migration Nation and researchers at the Environics Research Group, Robin Brown and Kathy Cheng provide comprehensive insights into the consumer behavior of New Canadians. The authors segment New Canadians based on their settlement experience and ethnicity to contextualize their consumer behavior. The authors advise on how to appeal to the experiences of immigrants with brands that may be established in their home countries, or with newer brands by triggering old associations with pre-migration experiences. Consumers cling to old brands and while this poses challenges for marketers, recognizing ethnic patterns and gaps in purchasing habits would be advantageous for marketers. The marketing challenge in Canada today is this: “In a more homogenous, less mobile, less connected society, understanding your market was easier. Leaders didn’t need to stretch their imaginations to speculate about the tastes and desires of the Canadian population.”  Today, New Canadians are connecting with families and friends in distant homelands via social networks. Hyperconnectivity, hyperdiversity, changing attitudes towards minorities, as well as the rise in fortunes of home countries of migrants are all defining Canadian diversity today, creating complex new markets and sub-markets to conduct business in. Multicultural marketing is not just for Canadians: the British do it, the Americans do it, and many regions in the Middle East and Asia have done so for many years. What’s specific—or special—about Canadian multiculturalism, however, is the projected or potential newcomers (spiraling over the last few decades), temporary residents (like myself) or globalized workers who opt to spend a large portion of their working lives in this country at their convenience. Canada’s migrants are accelerating this country’s diversity and progress with their contribution to society, economy and other Canadians. It is important to be aware of opportunities in this new environment; marketers must adapt to these new narratives quickly. Migration Nation should be recommended reading for all research analyst / market research programs in Canada and the U.S.
Brown, Robin, and Kathy Cheng. 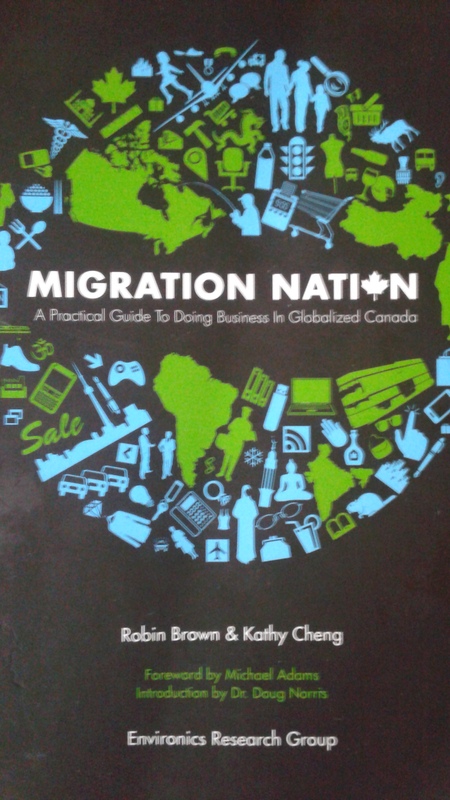 Migration Nation: A Practical Guide to Doing Business in Globalized Canada. Toronto: Environics, 2014. Print. Enjoyed this review! On my to read list, now! Thanks. So glad you liked the review and for dropping the message, Dr. Baker! It was indeed an enjoyable read.